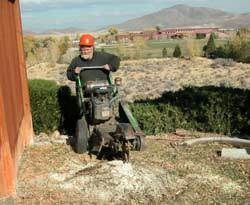 The stump grinder chews stumps into small chips that make excellent mulch. It will fit through a 30 inch gate and can go almost anywhere without damaging the landscape. Our hydraulic stump grinder can tackle huge stumps without the disruption of a backhoe and dump truck. It will fit through a 36 inch gate. 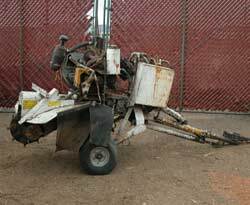 For stumps in a foundation footing a backhoe is available. Mulberries often have surface roots. 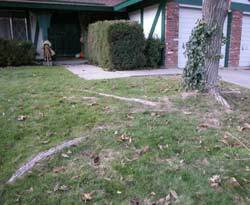 We can usually remove smaller roots more than five feet from the trunk. Consult our Certified Arborist.